The Pound's drop cools off after reaching the 1.3035 support level. Yesterday, the British currency continued its weekly drop as the year on year CPI (inflation) figure did not meet expectations. Investors were looking forward for an increase in inflation from 2.4% to 2.6% in order to back a rate hike by the BoE this August. Unfortunately, the inflation number missed expectations and the probability of a rate hike immediately started decreasing which applied downward pressure on the Sterling. Following this week's disappointment in wage growth and inflation, investors will be looking forward for today's Retail Sales figures from the U.K. If we see weakness from this front, the pair will most likely drop down towards the lower end of the support level. On Tuesday, the Pound failed to reverse the general downtrend by remaining below the 200-period moving average. The pair also formed a bearish, reversal double top pattern signaling the end of the short term bullish momentum. 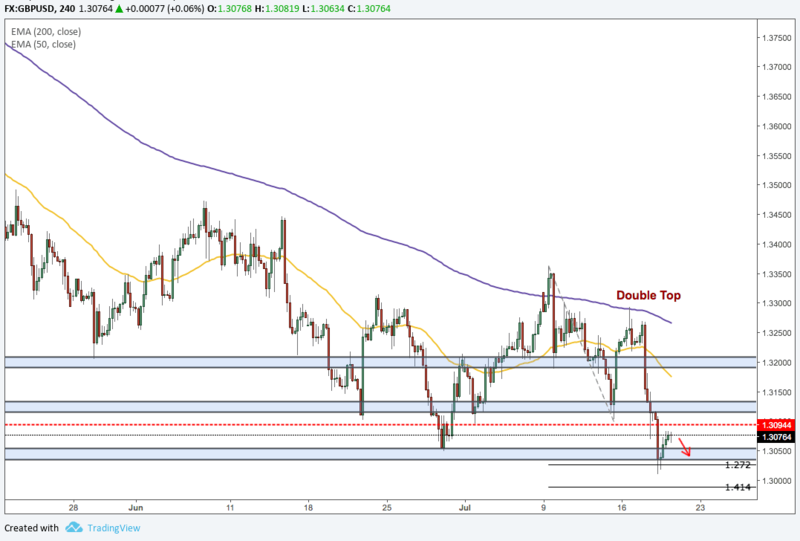 The currency then broke down below the 1.30944 and fell towards the 1.3035 support level before bouncing back up. The trend remains bearish as long as the currency remains below the 1.30944.